>i can’t get over the hedges. 2. since 96% of my blog frequenters are personal acquaintances of mine…the excluded 4% is comprised of a couple mormons and pat sajak. there were so many amazing things that i did and saw and ate and experienced, but the one thing that blew me away and really got my heart beating: hedges. more specifically, the hedges that they have in the generalife section at the alhambra. the alhambra is this 14th century fortress in granada. it was erected while the muslims ruled in spain, and the islamic architecture and itricate detail work is absolutely incredible. and don’t get me wrong, the rooms were beautiful and enchanting and i was completely captivated by the entire fortress. well. the entire trip really. the mediterranean sea was pretty tight too. childish? maybe. but totally honest and straight from moments of pure wonder. karlie was off snapping photos of the gorgeous flowers in another section of the garden, but i just kept getting pulled deeper into the living walls. there was this ornate fountain in front of me lined with flowers and vines and little streams of water going every way – totally magnificent – but i was continually beckoned by the archways in the corner of the ‘rooms’. i would walk past one and it was like the gardens were whispering “come in here. you need to know what’s beyond my walls.”and the garden was right. it must have known that i am a detective at heart and that i wouldn’t sleep well if i didn’t investigate the entire blueprint of the hedges. maybe that’s just the adventurer coming out in me. the “explorer inventor” in his element. but i felt at home among those hedges, and here i am a month later using flowery language and giving these living walls a voice. reminds me of the talking trees from the wizard of oz. anyway. 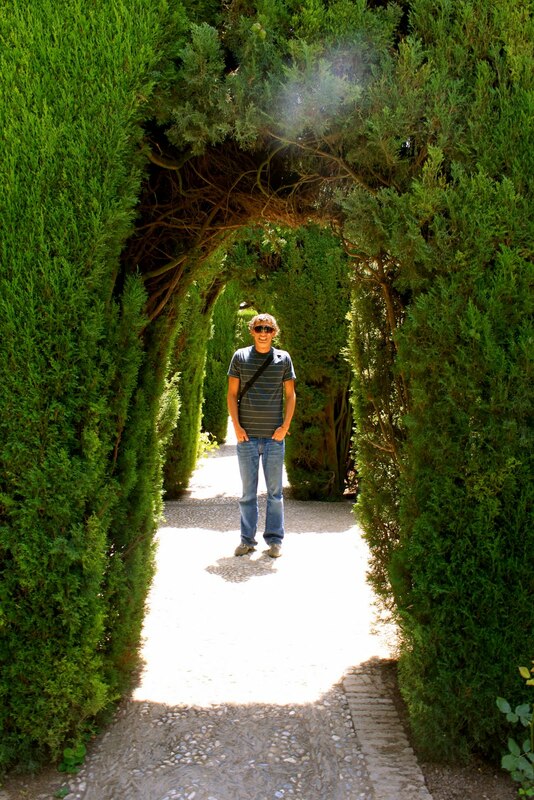 now you know my favorite part about spain: the mysterious hedges within the alhambra. you also probably now know more about the inner workings of my soul – something that i didn’t truly realize until just recently. consider yourselves up to date on my own search for self. >i like this post a lot.hp and the gof? >Hey Adam! Isn't it so cool to visit other cultures/countries and appreciate the difference. I can see you growing hedges in your first back yard! Kansas can grow hedges, I think . . . . Previous Previous post: >air jesus. Next Next post: >father/son trip to stl.